This Sunday I'll participate as a vendor at the Big Crafty at the Asheville Art Museum from 12pm to 6pm. I'm really excited because this is my first time doing this show and I get to go and see Maggie too. As part of a fundraiser for the Big Crafty, I made a belt buckle and donated it. 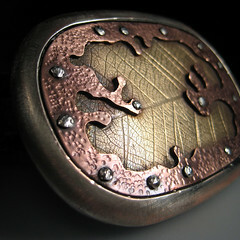 The "Organic Leaf Belt Buckle" will be auctioned at the show. I'll also get to meet some of the folks from Lark Books! I'll be included in two Lark books for next fall and I'm absolutely thrilled. Very cool Sara! I love that belt buckle.